North Park Lexus at Dominion is pleased to announce that Lexus just opened up FULL TAX CREDITS on all new RX 350 and RX 450 Hybrids leases!!!!!! This incentive is only good for a limited time and literally saves you THOUSANDS of dollars on a RX lease!! Using the just announced tax credit with all other available lease incentives, you can lease a brand new 2015 Lexus RX 350 starting at $479 a month. We have over 200 new RX 350’s available for immediate sale and are ready to show you why 20,000+ Lexus owners have put their trust and business with the North Park Lexus organization over the past 21-years! 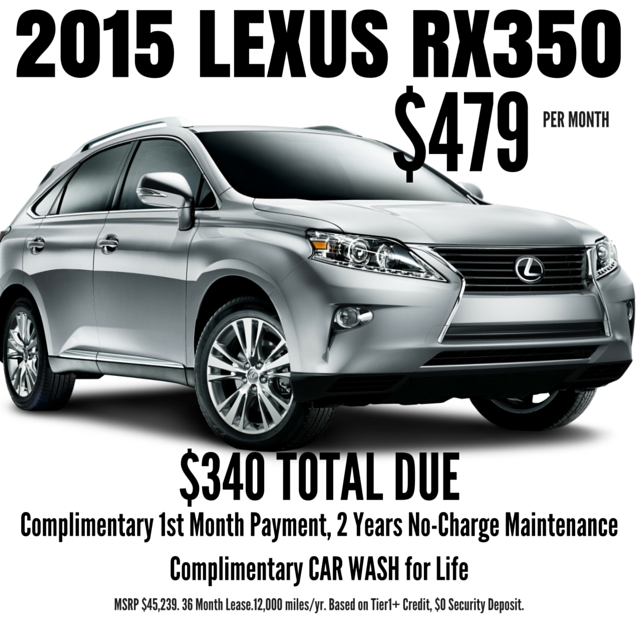 Please visit our website for more information on this fantastic offer at northparklexusatdominion.com. You can also respond back to me directly or call my cell number which is listed below if you need any additional information or if I can help in any way!